With high water and impassible roads in some areas, health centers and clinics are working to treat patients in need. Hurricane Florence deluged the Carolinas throughout the weekend, and widespread flooding is still being reported throughout the region. The slow-moving storm has dumped more than 30 inches of rain in some areas, and hundreds of water rescues in towns across the state have been underway by first responders. The impacts of the wide-spread flooding are still coming into focus, since many communities lack power. Direct Relief staff have been on the ground in North Carolina since before Hurricane Florence made landfall, delivering requested emergency medical aid, and coordinating with local health staff, many of whom are reporting serious impacts to their communities. Goshen Medical Center has multiple locations across the eastern portion of the state and Kimberly Smith, Goshen’s Director of Clinical Operations, said Monday that flooding and tornadic activity drastically changed the situation overnight. Sheri Rettew of the Hope Clinic in Bayboro, North Carolina, was also strategizing how to reach people needing care. Her clinic is located in Pamlico County, where 41 percent of the county’s 13,000 residents suffer from chronic illnesses, including high blood pressure, diabetes, and asthma. Rettew expressed concern that many of the clinic’s patients would return to their homes and not have access to the medicines they need. Hope Clinic staff will be conducting medical care this week in a local shelter where several hundred residents have been living in the storm’s wake, Rettew said. Direct Relief provided two Emergency Medical Backpacks for Hope clinicians to use as they see patients, as well as an Emergency Health Kit, filled with medicines to manage chronic conditions, as well as other critical medicines and supplies, like antibiotics and wound care items. In Raleigh, North Carolina, Direct Relief has been coordinating with Advance Community Health, which treats more than 25,000 patients in the region each year. Chief Operating Officer Ryan Jury said that the health center conducted medical outreach services at local shelters in Raleigh over the weekend. Last week, Jury reported that one concern was about evacuees running out of medications to manage chronic illness or getting sick. 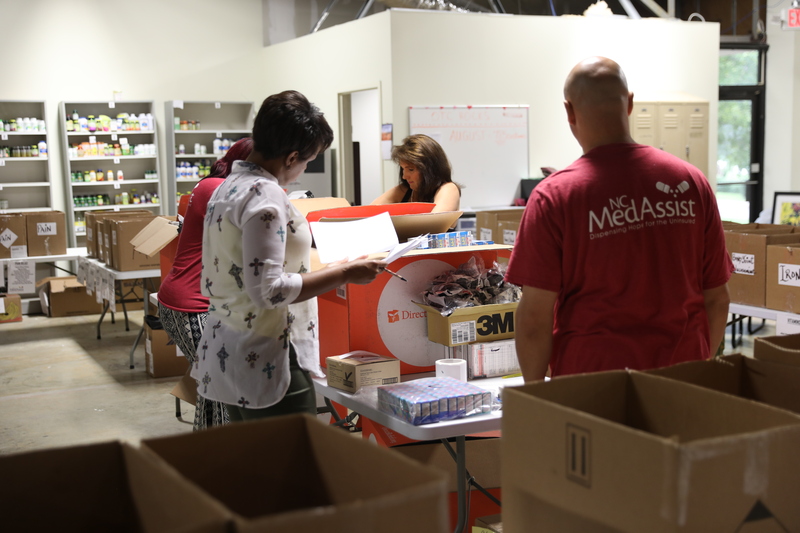 The group was working to provide access to medications to evacuees if needed, and had created an expedited process so displaced people could be seen by a provider quickly and provided with prescription refills. When residents are forced to evacuate their homes due to a natural disaster or emergency, medications needed to manage chronic conditions are often left behind. Insulin needed to manage diabetes, hypertensives for high blood pressure, or inhalers for asthma are all essential for a person with these conditions. Without proper medication, that person can quickly fall in to medical crisis. Direct Relief has shipped Emergency Health Kits to both Goshen Medical Center and Advance Community Health, as well as other local clinics and centers. Direct Relief will continue to ship requested supplies as needs become known.